Let’s take a look at Hotel on the Corner of Bitter and Sweet by Jamie Ford from a writer’s perspective. The story moves back and forth between two timelines, one in 1986 and and one in 1942 (with a brief hop to 1945). Jamie Ford deftly intertwines the two until in the end they become one. Hotel on the Corner of Bitter and Sweet has a limited number of characters. The protagonist is Henry Lee, an American of Chinese descent. During the 1942 timeline he befriends Keiko Okabe, a girl of Japanese descent who considers herself to be American and doesn’t speak Japanese. Henry’s father serves as an antagonist. His father came directly from China and has a strong bias against the Japanese because they had invaded China during the World War II. Another antagonist is a bully from school named Chaz. Other characters from that timeline are his friend and protector, Sheldon, and a mentor of sorts, Mrs. Beatty. In the 1986 timeline, Henry interacts mostly with his son Marty and Marty’s fiancee, Stephanie. Henry had recently lost his wife Ethel, which is in a lot of ways an inciting incident. 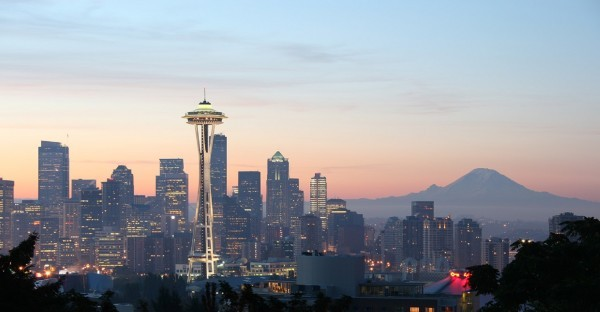 The physical setting is Seattle, shaped by the times. As Karen pointed out in her review, the hotel in the title, Hotel Panama, sets at the interface between Chinatown and the Japanese community. In 1942 few — other than Keiko and Henry — cross the border. The title is appropriate. It is a bitter tale because of the extreme racial prejudice that drives people apart, but it is also a sweet tale because of the young love that transcends prejudice. The end the story holds no surprises, but wraps up in a satisfying way. It was a bit disappointing Henry didn’t solve the “mystery” of what happened to Keiko himself. That role fell on future daughter-in-law Stephanie and Marty. Perhaps Jamie Ford didn’t want Henry to seem disloyal to Ethel. In the 1942 timeline, he had been exceedingly brave to be with Keiko so it was surprising he was so passive in 1986, except when viewed in light of the personal cost of his wife’s lingering illness and death. The historical part of the book is fascinating. I have read other books about the Japanese American Internment and have visited a site of one of the camps near my former workplace in Arizona. I knew some of the things, like that some of the Japanese Americans left the camps to fight in the war, but other details were new. People familiar with the history of the time will probably still enjoy it. There were a few historical accuracy blips, but mostly from the later timeline. Other reviewers have pointed out that there weren’t computers or CDs in 1986, as mentioned in the hospital scene. It is interesting that the 1942 timeline seemed tighter and more accurate. I must admit I shy away from writing historical fiction because I know I’d find it difficult to remain true to another time. Readers of historical fiction are bound to find and point out those kind of discrepancies. Overall, Hotel on the Corner of Bitter and Sweet takes on a difficult topic in a meaningful way. Be prepared to be charmed. 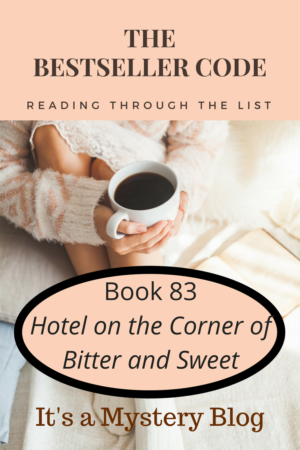 Have you read Hotel on the Corner of Bitter and Sweet by Jamie Ford ? We’d love to hear your thoughts. If you ever have questions about what we are reading next or when we’re starting the next discussion, check the 100 Book List tab in the navigation bar at the top of the blog. Links in the list go to the landing page from this blog where the discussion starts. However, this is an open-ended challenge so feel free to jump in with any of the books at any time after the discussion begins. Hotel on the Corner of Bitter and Sweet by Jamie Ford is next up on our 100 Bestsellers List reading challenge. This novel is categorized as Historical Fiction. We’ve now read eighteen of the one hundred books recommended by the computer model in The Bestseller Code by Jodie Archer and Matthew L. Jockers. Most of these books were of genres that I do not usually read and, to be honest, many of them I did not like. If it weren’t for the fact that I needed to write a review, I would have set a couple aside without finishing them. I’m happy to say, though, that Hotel on the Corner of Bitter and Sweet by Jamie Ford does not fall into this category. I really liked this book! Hotel on the Corner of Bitter and Sweet is set in one location, Seattle, but in two time periods: 1942-45 and 1986. Ford obviously knows Seattle well, and his descriptions of Seattle during the WWII years really drew me into the story. I found those sections of the novel to be the strongest in all areas – settings, characters, dialogue, and plot. The 1986 sections didn’t feel as strong, and I thought that Ford could have done a better job in conveying the relationship between Henry and his son Marty and also in more fully developing the son’s character. But it still worked for me, mainly because I could envision the lack of communication and the misunderstandings between father and son. Also, the fog that seemed to envelop Henry due to the long illness and recent death of his wife Ethel was easily attributed to grief and an intentional device by the author, rather than poor writing. What’s in a name? Well for a start, sometimes, ten million dollars. So it is worth thinking a bit about how to get it right. Some bestselling titles refer to physical settings. Cold Mountain. A Painted House. Black House. Shutter Island. Maine. We learn something from each of these titles about the prominence and agency of place. The place in these novels provides the impetus for the story, or it will if the novel is well named and well written. By the end of such a novel, we will feel an intimacy with the fictional place as though it’s its own voiceless character. The title Hotel on the Corner of Bitter and Sweet describes the Panama Hotel, which acts as a keystone to this story. As Roberta states in her #BookBeginnings post, the Panama Hotel is mentioned in the very first line of the book. In 1942, the Panama Hotel “stood as a gateway between Seattle’s Chinatown and Nihonmachi, Japantown,” thus setting up one of the main themes of the novel. Henry Lee, who lives in Chinatown, has been indoctrinated by his father to hate all Japanese, including Japanese-Americans. And yet he develops a school friendship and eventually a romantic relationship with Keiko Okabe, a second generation Japanese American who resides in Nihonmachi and is removed to an internment camp. In 1986, items stored by the interned Japanese-Americans, including Keiko’s family, are discovered in the basement of the hotel, and Henry is finally forced to acknowledge his long buried feelings for Keiko. So not only does the title tell us something about the place, but also sets up the tone of the story, bittersweet. Anyone who has had a childhood sweetheart or a lost love will identify with Henry and Keiko. Like Romeo and Juliet, from the start you know their friendship, and then their romance, is doomed to end tragically. Yet you hope this story will be different. Henry will find a way to save Keiko from the internment camp. Or when the war ends, they will reunite and live happily ever after. But that doesn’t happen, which makes this story all the more believable. Both Henry and Keiko move on after the war, finding new loves and creating new lives. But neither of them forgets their first love and what could have been, had the war and Henry’s father not intervened. Ultimately, even though it takes forty-some odd years, there is a happy ending. One of the reasons I love reading Historical Fiction is the opportunity to learn about specific times and places in history. If the author has done his/her research well, the story line and characters create the opportunity to more fully understand how people were impacted by a specific historical event. Such is the case with Hotel on the Corner of Bitter and Sweet. Other than a brief mention in my high school American History textbook, I’ve never read anything about the internment camps of WWII, nor the details of how the internment of our Japanese-Americans occurred. I’ve read that German-Americans were stigmatized and targeted during WWI, similar to the experience of the Japanese-Americans, although internment camps were not part of the equation for them. I always found it interesting that many German immigrants and first generation German-Americans enlisted to fight in WWI, both as a way to protect their families at home in the States and also to prove their loyalties as Americans. I was unaware that the Japanese-Americans did the same thing during WWII, even though they and their families were placed in the internment camps. Can you imagine volunteering to fight in a war for the country that had removed you and your family from your home, forcing you to leave behind all but a few meager possessions, and placed you in a internment camp where you were surrounded by barbed wire and armed guards? Even though most of us in the United States are descended from immigrants, within a couple of generations we lose the memories and stories of what life is like as an immigrant. We come to believe that our outlook on life, our day-to-day experiences as Americans, are the norm. It’s good and even necessary to read books like Hotel on the Corner of Bitter and Sweet in order to remind ourselves of the challenges and prejudices immigrants face every day, even today. Especially with the insular political climate of today, we need more books like this, books that allow us to view life from the eyes of immigrants, our newest Americans. For that reason alone, I would recommend adding Hotel on the Corner of Bitter and Sweet to your reading list. The fact that it’s a bittersweet story with a happy ending is an added bonus. What did you think of Hotel on the Corner of Bitter and Sweet? Have you read any other books about the Japanese-American internment camps? Do you think books like Hotel on the Corner of Bitter and Sweet can help us inculcate a better understanding of our current immigrant population? Time to start the discussion of our next novel from The Bestseller Code 100 list, Hotel on the Corner of Bitter and Sweet by Jamie Ford. Have you written about Hotel on the Corner of Bitter and Sweet by Jamie Ford ? Feel free to add a link in the comments.